Over-medication, unnecessary tests or preventable surgeries may prolong recovery or hurt long term well-being of patients. Irrespective of how we want to view the statistics, there is a good possibility of hurting your health while seeking medical help. Health is an enigma. Getting the right healthcare support is an even bigger one. According to the WHO, "Patient safety is a serious global public health issue. Hospital infections affect 14 out of every 100 patients admitted. Hundreds of millions of patients are affected....50% of complications associated with surgical care are avoidable." This should be enough for us to sit up and take notice. Beyond these facts, over-medication, unnecessary tests or preventable surgeries may prolong recovery or hurt long term well-being of patients. Irrespective of how we want to view the statistics, there is a good possibility of hurting your health while seeking medical help. While we can aspire for zero-defect medical support, it is equally true that the human body is the most complex machinery on this earth and that medical science is far from perfect. Adding the emotions and anxieties of patients and their families to this mix takes the complexity to a new level. Further, if we superimpose the increasingly aggressive goals of speed and profits, like in every other industry, the healthcare system is bound to confound us. It is not just the doctors who are looking for a quick turnaround, the speed bug has afflicted the patients as well. When I hear stories of the family physician from my mother, they seem to come from a different world. Things are not so simple any more. Gone are the days when the good old doctor spent hours with the patient to get to the root cause of an ailment, took a holistic view and offered advice on lifestyle and nutrition, proactively talked about adverse effects of medical interventions, provided a prognosis on the disease and suggested preventive measures before jumping to a prescription. It is not just the doctors who are looking for a quick turnaround, the speed bug has afflicted the patients as well. Many of us want to be up and running in no time and can't withstand even the slight discomfort that comes when the body's natural defence mechanism is at work. Generous insurance cover, though much needed, also distorts incentives for patients and healthcare providers alike. Long-term effects on a person's well being are ignored and whenever something goes visibly wrong, healthcare providers are squarely blamed. Who initiates and who propagates this vicious cycle is immaterial--cutting through it and coming out unscathed is more important. So what should we do as patients or their families? While seeking medical help, investing time and energy to influence your health outcomes is a necessity, more so than ever before. Are you ready? When I look back, I was so blissfully unaware and stressed that going with the flow at the hospital and hoping for the best seemed like the only option. Whenever things worked out fine at the end, I was relieved and easily forgot about the hiccups on the way. When things started going downhill, it felt like I was trying to find my destination through a never-ending blind alley. In my moments of frustration, I was angry that the government was not fixing the gaping holes in the system; I was pained that no one cared. I don't think it helped my situation. This is not to say, that the healthcare ecosystem should not be fixed. But it will not happen overnight, especially given the complexities I have talked about. Unfortunately, as patients, we don't have the luxury of time. When I reflected on my experience with objectivity, I realized I could have taken more ownership of the issue and influenced the course of treatment, for my own good. Blind faith doesn't work anymore! 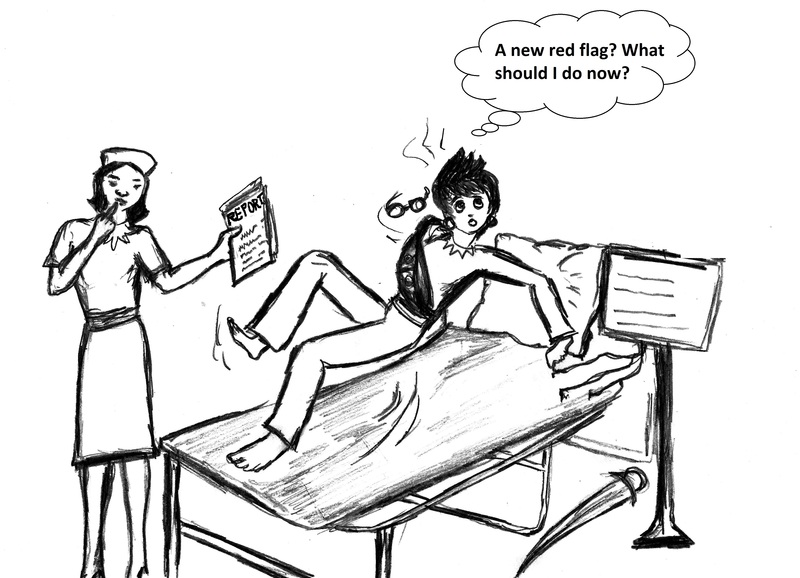 Now the patient needs to be more proactive and safeguard against many pitfalls along the way. The key is to develop a better understanding of your own health situation, become aware of tricky situations while seeking medical help, think properly about the different choices for treatment and their different trade-offs. In my book, The Ninjja Sutra: Surviving The Healthcare Web, I have used real-life experiences to surface the challenges and shared practical wisdom to help us influence our health outcomes for the better. I will expand on one theme at a time in subsequent posts. Taking charge of your most precious asset--your health--is your only option. This should not stop at diet, exercise and stress management. While seeking medical help, investing time and energy to influence your health outcomes is a necessity, more so than ever before. Are you ready?